Lieutenant Dan Daspit, captain of the U.S. submarine Tinosa could notbelieve his luck. Framed neatly in the periscope eyepiece was a sitting duck. The 19,250-ton Japanese tanker Tonan Maru No. 3 was all alone, dead in the water. Tinosa was on her second war patrol, having left Midway atoll on July 7, 1943. For a week she had been prowling along the Japanese sea routes between Borneo and Truk. On the afternoon of July 24, Daspit spotted a thin trail of gray funnel smoke on the horizon. Remaining submerged, he set up a textbook approach and fired four Mark 14 torpedoes at the ship, which was making only 10 knots. Every one of his “fish” ran true. Thirty seconds later, the sonarman heard the repeated thumps of the torpedoes striking the hull, but no explosions. The tanker turned and increased speed. Swearing, Daspit turned in pursuit. After a long nighttime chase, he was in position to try again. His torpedomen checked every fish to make sure it was working perfectly. Then, coming at the tanker from the starboard quarter, he fired two more torpedoes. Both hit and exploded. The muted rumble echoed through Tinosa’s hull. The crew cheered. The Tonan Maru had been hit in the engine room and coasted to a stop. An experienced submarine commander, Daspit took his time approaching the ship’s port side. He would fire one torpedo at a time from 1,000 yards, aimed to strike the tanker’s hull at exactly 90 degrees. The 680 pounds of high-explosive Torpex would blast a huge hole in the hull. Two or three fish should send her to the bottom. The tanker could not run. Tinosawas going to hang the huge Tonan Maru’s scalp on her belt. At 0930 hours, Tinosa fired her first torpedo. It ran straight and true. The wake was a long deadly white finger reaching out to touch the helpless ship. Then nothing happened. The torpedo had failed to explode. This was nothing new to the American submarine fleet, so Daspit fired again. No towering column of water erupted from the tanker’s hull. No crushing roar echoed through the deep. Gritting his teeth in frustration, the sub’s skipper fired again. And again. Five, then six deadly Mark 14 torpedoes, the most advanced antiship weapons in the U.S. inventory failed to explode. The fifth one appeared to raise a tall plume of white water as a tinny “Phwyinng!” noise came through the hull. Number six broached and leaped after striking the enemy’s hull, then sank. Then the tables turned. The Tonan Maru had radioed a distress call. A Japanese destroyer was coming with a bone in her teeth. Tinosa had to depart the area fast. 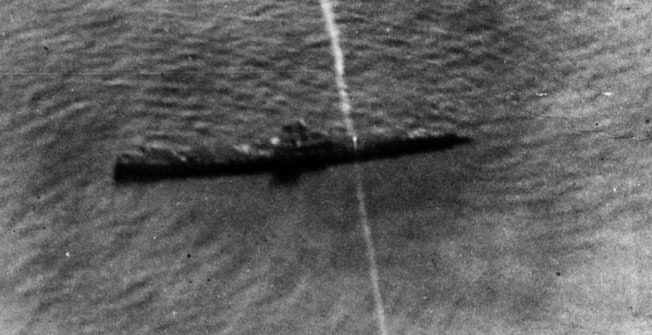 Daspit fired two more torpedoes at the tanker as his submarine turned away. The sonarman reported that both weapons seemed to hit and then stop. As his sub raced eastward, Daspit wrote of the frustrating hunt in his log. “I find it hard to convince myself that I saw this.” He had no explanation for why the torpedoes failed to explode. Out of 15 Mark 14s fired, only two had detonated, and those had been fired from what was considered to be a very oblique angle. The others were so carefully set up as to be right out of the textbook. Yet not one had done its job. Daspit headed directly back to Pearl Harbor doing what no American sub skipper ever wanted to do, returning with an “empty bag.” He was met at the Sub Pier by the new Commander, Submarines, Pacific (COMSUBPAC), Rear Admiral Charles Lockwood, a career submarine officer. Lockwood was a hard-driving, conscientious officer who had the reputation for giving full support to his squadrons, his boats, his commanders, and their crews. He took Daspit up to his office where the exasperated sub skipper related what had happened with the Tonan Maru. But when the single torpedo Tinosa had brought back to Pearl was examined at the Submarine Base torpedo shop, it was found to be in perfect working order. A week after the Japanese attack on Pearl Harbor, the submarine USS Seawolf fired a total of eight torpedoes at an enemy freighter. Only one of the unreliable torpedoes struck home, and it failed to explode. Lieutenant Commander Daspit’s report was the most recent and extreme case of what had been a growing problem within the U.S. submarine fleet since the beginning of the war. From the first patrols after the Commander-in-Chief U.S. Pacific Fleet (CINCPAC), Admiral Chester Nimitz, had ordered unrestricted submarine warfare on all Japanese shipping, submarine commanders had been complaining of torpedoes that failed to work properly. On December 14, one week after Pearl Harbor, the USS Seawolf encountered a Japanese freighter near the Philippines and fired eight torpedoes. Seven missed, one hit. And failed to explode. So began the litany of problems with the Navy’s technical marvel. 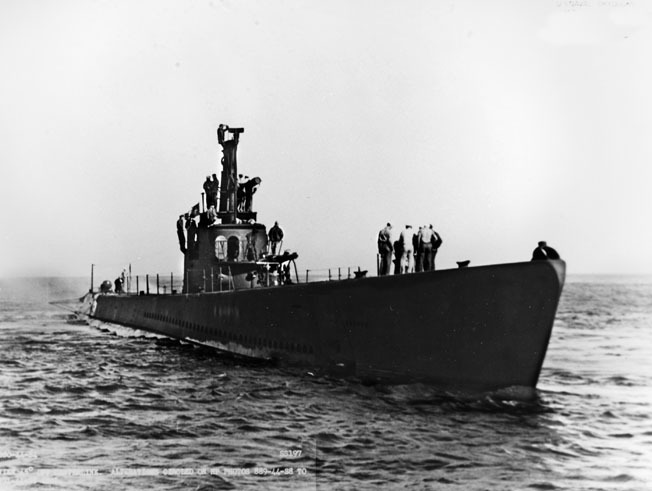 In the first months of war, American subs fired 97 torpedoes at enemy shipping. Only three ships were sunk. Some failed to explode, while others, even though aimed with care, seemed to miss or run under their target. Even worse, several had blown up before hitting the side of a Japanese ship. Torpedoes were the first totally autonomous guided missile. The German Navy had sunk hundreds of Allied ships in World War I with torpedoes, and by 1925 the latest versions were highly complex machines. The Mark 14 was developed to replace the older, shorter Mark 10 that had been in service during and after World War I. Designed primarily by engineers at the Navy Bureau of Ordnance (BuOrd), the Mark 14 was built at the Newport Torpedo Station (NTS) beginning in 1926. At 21 feet long, 21 inches in diameter, and weighing more than 3,000 pounds, the Mark 14s were large and expensive weapons. Powered by steam, they could run for 9,000 yards (5.1 miles) at 46 knots. They were extremely complex and required the most meticulous machine and assembly work. By 1940, they cost upward of $10,000 each, five times as much as a new automobile. The most important component was the Mark 6 exploder, without which the torpedo would be useless. The certain way to sink a ship was to break its back at the keel. This often caused a ship to break in two. Obviously, this required a torpedo to explode under the hull. To this end BuOrd had designed the new exploder based on the successful British Duplex and German magnetic mine designs. Its most radical feature was the magnetic influence exploder, Project G53. It was a closely guarded secret, so much so that even though a maintenance and operating manual had been written it was never printed or distributed. The magnetic exploder was triggered by the influence of a steel hull as it passed directly beneath a ship, where there was no armor. For this reason, the first Mark 14s carried a moderate warhead. BuOrd was under a tight budget and saw no reason to spend money on unnecessary testing. Only one test of the Mark 6 was conducted in May 1926. The target, ironically, was a derelict submarine. Two Mark 14s armed with the magnetic exploder were fired at the sub. One ran under the target and failed to detonate. The second one exploded and sank the sub. What was not being taken into account were variations in the Earth’s magnetic field. The Mark 6 was highly sensitive and too likely to detonate with even minor fluctuations. This was not considered a flaw, and in 1934 the Mark 6 was approved for fleet use. No further testing was done. The U.S. submarine force went into combat with a torpedo with a 50 percent failure rate. In 1939, the Navy demanded a larger warhead, and BuOrd authorized its increase to 680 pounds, enough to tear open the most sturdy hull. But, as events proved in the first year of the war, the magnetic exploder worked too well. Several sub skippers fired at their targets only to witness premature detonation well before the torpedo was close enough to do serious damage. Often the enemy ship suffered little more than dented plates that were easily repaired. The Mark 6 also had a contact exploder, which consisted of a trigger, firing pin, and detonator. In essence it was not much different from a gun’s trigger, firing pin, and the primer in a cartridge. When the torpedo struck a ship’s hull, the head was rammed backward, driving the firing pin into the detonator over the warhead, causing it to explode. The contact exploder was intended to provide a backup in the event that the magnetic pistol failed to work. But since the warhead exploded even before contact with the hull, it was useless. By mid-1942, more than 800 torpedoes had been used in the Pacific War. Eighty percent had failed. 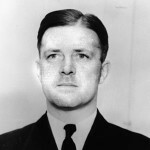 But at Pearl Harbor, COMSUBPAC Admiral Robert English consistently sided with BuOrd and blamed his sub skippers for their “lack of initiative.” But the man who would soon change everything, Rear Admiral Charles Lockwood, then commanding submarines in the Southwest Pacific and based in Australia, was listening to his own submarine skippers. He undertook an unofficial test of the torpedoes in June 1942. Lockwood supervised firing torpedoes set to specific depths through a submerged net. This was the first real test of the Mark 14 since 1926. The holes in the net showed that the torpedoes were running far below the set depth, sometimes as much as 10 to 15 feet. This was conclusive proof, but again BuOrd dismissed the findings and said the submarine commanders were not trimming the torpedoes properly. Finally, under pressure from Admiral Nimitz, himself a former submariner, BuOrd conducted its own tests in August 1942. The root of the depth-setting problem had been the fault of BuOrd. When they increased the size of the warhead, which made the weapon heavier, they failed to make changes in the mechanism that controlled depth. Yet the erratic depth was only one of three major problems with the torpedoes. Dozens of torpedoes were exploding well before reaching the target. The cause was the hypersensitive magnetic exploder. It was being triggered by a combination of the Earth’s magnetic field and the approach to a ship’s hull. These problems should have been found and fixed long before the war began. Rear Admiral Lockwood was appointed COMSUBPAC in January 1943. When his captains turned in numerous reports of premature explosions or duds, BuOrd steadfastly maintained that there was nothing wrong with the torpedoes, but that the problem lay with bad approaches and poor maintenance. This naturally started a furor among the submarine fleet personnel. U.S. sub crews were risking their lives for nothing. The transports and warships of the Imperial Japanese Navy sailed on, unmolested. A torpedo equipped with a magnetic influence exploder passes under the hulked submarine L-8 (SS-48), during tests off Newport, Rhode Island, 26 May 1926. This torpedo failed to explode. Copied from U.S. Naval Administration in World War II, Bureau of Ordnance: Naval Torpedo Station, Newport, R.I., Volume VII, held by the Navy Department Library, 1978. U.S. Naval History and Heritage Command Photograph. Lockwood requested permission to disconnect the magnetic exploders on the torpedoes, but BuOrd would not allow it. The submarine crews were forbidden to do anything beyond regular maintenance to the torpedoes. They were not to touch the Mark 6 exploders. To prevent any unauthorized tampering, BuOrd ordered that the Sub Base torpedo shop apply dabs of paint to the screws that held the exploder mechanism to the torpedo body. Any attempt to remove or tamper with it would mar the paint. With the zeal that American military men sometimes take when going against orders, some torpedomen went into the shop and asked about the color of paint. If they were told it was blue, they found a small can of blue paint to retouch the screw heads after they had personally worked on the exploders. In the event a torpedo was returned to the shop, there was no way for anyone to know the mechanism had been touched. As the number of duds and premature explosions rose, there could be no doubt something had to change. In the summer of 1943, Lockwood flew to Washington and defended his skippers to BuOrd, demanding that something be done. In June, under pressure from the Chief of Naval Operations (CNO) Admiral Ernest J. King, the order came down to disconnect the magnetic exploders from all the torpedoes. When the Tinosa left Midway on her second patrol this had been done. Lt. Cmdr. Daspit had every reason to believe his load of Mark 14s would do the job. This proved to be a forlorn hope. While the Tinosa’s patrol was not the incident that broke the camel’s back, it was the most appalling. The complaints continued to mount. Lockwood’s staff began a systematic examination of the problem. That is when Lockwood took personal action. In order to convince BuOrd that the problem was not with his subs, skippers, or crews but with the torpedoes, he called in Commander Charles B. Momsen. “Swede” Momsen, whose outspoken habit of going against the official grain had earned him few friends in the Pentagon, was one of the most innovative submarine engineers in the Navy. He had overseen the rescue of the crew of the USS Squalus after it sank off Portsmouth, New Hampshire, in 1939. He was the inventor of the Momsen Lung, the portable breathing device that saved hundreds of submariners from sunken subs. He was also the father of the submarine rescue chamber that had become part of the Navy inventory since 1939. The modern submarine Navy owes the lives of many of its men to Swede Momsen. Momsen was in command of Submarine Squadron (SubRon) 2. Even after the BuOrd order, the reports of dud hits continued to pour in. Momsen, who had to endure the frustration of his skippers carrying useless torpedoes all the way to Japan for nothing, began to apply his engineer’s mind to the solution. The first step was to find out why the contact exploder did not work, even when fired under optimal conditions. He scoured charts of the waters around the Hawaiian Islands to find a place where sheer vertical cliffs went right down to deep water and a sandy bottom where torpedoes could be recovered after firing. An area on the coast of the small island of Kahoolawe was perfect. Momsen, along with COMSUBPAC’s gunnery and torpedo officer, Commander Art Taylor, supervised live firings from the USS Muskellungeat the cliffs beginning on August 31. The first two exploded. The third one did not. 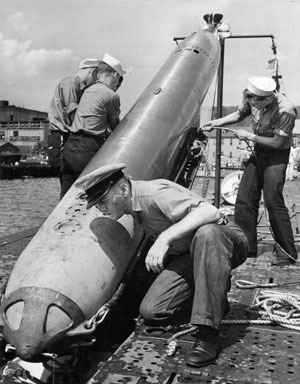 Momsen himself went into the water to examine the torpedo. It was broken in two with the warhead split. Taking extreme care, the crew hoisted the unexploded torpedo onto a barge and took it back to Pearl Harbor. After disconnecting the warhead, Momsen and his crew found the reason for the failure. The contact exploder, while a marvel of engineering, was both too ruggedly built and too delicate. This was further studied by sliding a torpedo warhead filled with sand and a live exploder down a cable from a 90-foot “cherry picker” crane onto a steel plate to simulate different angles and speeds of impact. Seventy percent of the hits failed to explode. This further proved what Momsen had begun to suspect. Submarine commanders had been told that the best and most certain angle to fire a torpedo at a target was from exactly 90 degrees, or broadside on. Acute angles were less desirable. But as was shown by Tinosa’s experience, this was not true. Daspit had fired eight torpedoes at exactly 90-degree angles and not one had gone off. Ironically, the first two he had fired that morning after the long chase both detonated, even though they struck the tanker’s hull at a very oblique angle. Momsen and Taylor realized that the contact exploder’s firing pin was being distorted in a head-on impact, and the deceleration forces slowed the pin’s motion in its bearings. The spring failed to move it fast enough to set off the explosive charge. Examination of the primer showed hardly a dent, not nearly enough to ignite the warhead. The drop test showed that a glancing impact did allow the firing pin to act properly. In other words, the best angle to fire was anything other than dead on. Interestingly, BuOrd had made a small attempt to find the root of the problem by consulting Albert Einstein at Princeton University. The distinguished physicist examined the Mark 6 blueprints and concluded that the firing pin was being distorted by the impact. He recommended that a “void” between the outer shell and the firing mechanism would eliminate the problem. But BuOrd did not follow his suggestion. Momsen showed the test results to Lockwood, who then took them to Washington. He returned a few days later, as he said in his official war diary, “madder than hell.” BuOrd finally admitted the exploder was at fault and committed to designing a new one. But that would take a year or more. 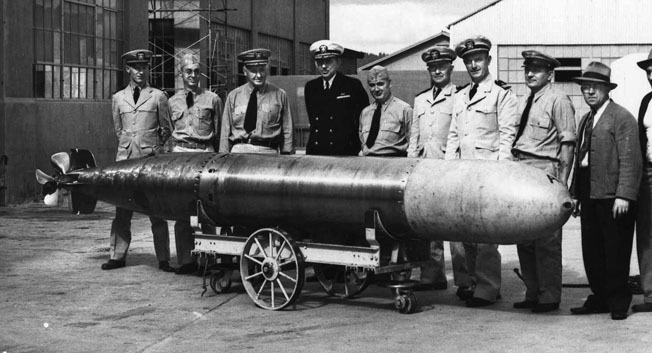 A group of naval officers stands behind a Mark 14 torpedo at the Navy’s Keyport, Washington, ordnance testing facility. Torpedo testing was often inconclusive and time consuming. Lockwood insisted on every single new exploder being perfect before allowing them to be installed in the torpedoes and loaded into his submarines. With every machine shop at the Sub Base working on it, by the late fall of 1943 the Pacific Fleet’s submarines were finally armed with reliable weapons. Underruns were still a concern. Taylor and Momsen again supervised tests. Firing torpedoes through a series of evenly spaced nets showed that not only were the Mark 14s running well below their set depth; they were not even running flat. They appeared to wobble, like a sine wave, alternately deep and shallow. This was not something that could be fixed at Pearl Harbor. It would have to go right to BuOrd. But at least Lockwood’s skippers could make allowances for the erratic depth settings. Momsen was promoted to captain and awarded the Legion of Merit for finding and solving the torpedo problem. He had played a significant but little remembered role in assuring that every U.S. submarine went to war against Japan with reliable torpedoes. By August 1945, 1,178 Japanese merchant vessels were sunk, totaling 5,053,491 tons. Of those, 55 percent were sent to the bottom by U.S. submarines. Author Mark Carlson has written on numerous topics related to World War II and the history of aviation. His book Flying on Film—A Century of Aviation in the Movies 1912-2012 was recently released. He resides in San Diego, California. Tags Albert Einstein, American, army, attack on pearl harbor, Australia, Borneo, British, CIA, defective torpedo, EAM, German, Hawaii, history of aviation, Japan, Japanese, japanese attack on pearl harbor, Marines, Mark 14 torpedo, Maru, military, missile, Momsen Lung, NATO, naval history, navy, Ney, Odin, Ordnance, OSS, Pacific, Pacific Fleet, Pacific War, Pearl Harbor, pearl harbor attack, Philippines, POW, Princeton, radio, San Diego, SAS, Squad, Squalus, submarine, Swede Momsen, Tern, the history of aviation, the japanese attack on pearl harbor, The Pacific, the pearl harbor, the pearl harbor attack, The Pentagon, Thor, torpedo, Tory, Troy, uss seawolf, USS Tinosa, warship, weapons, WIN, World War I, WWII History June 2017.